A trophy with a signature. On the second Saturday of August there occurs a grand water festival in Alleppey (Alappuzha), which has risen to the national festival of this part of the land. This boat-festival had its origin in 1952 the then Prime Minister of India; Mr. Jawaharlal Nehru happened to see this boat festival and he was so thrilled by the charm of boat race and he climbed on a boat and traveled in it to the town; neglecting the concerns of the security ring. On his return to New Delhi he sent a model of a ‘Snake Boat’ (known as chundan vallom) made of silver as the trophy for the winning boat. This ever rolling trophy has the signature of that great man. A season of boat races. There are several boat races in Kerala like Champakulam, Pulinkunnu, Aranmula Cheruthana, etc but the Nehru Trophy Boat Race held at the Punnamada Lake is the most famous and popular among them. 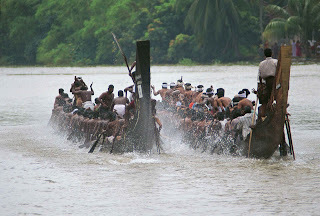 Each boat race has a history of its own like the Aranmula where there is only a procession and no competition of speed; it is essentially a festival of the temple in which the idol of the temple is ceremoniously taken for people to see. The Champakulam boat race is the oldest among them (it can compete with the oldest races in the world held consecutively for years. 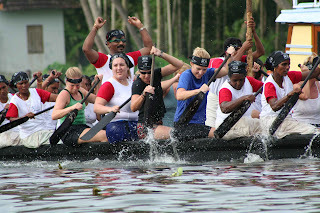 Other boat races held during the season are Neerettupuram Boat Race, Rajiv Gandhi Boat Race, PulimkunnuKaruvatta Boat Race, and the Haripad Mannar Boat Race. The Race on 12th August. The race held on 12th August will be inaugurated by Mr. K. G. Balakrishnan the Hon. Chief Justice of the Supreme Court of India. The snake boats take less than five minutes to cover track has a length of 1365 meters and in each year the time taken is getting reduced. All the boats which reach in the final round get the money; winner of the first prize is to get prize money of Rupees 200, 000; the second and the third get 1, 50,000 and 1, 00,000 Rupees each; where as the fourth has to be satisfied with Rs. 500, 000 (one dollar is equal to about forty rupees). A gold medal for the first and silver for the second is this year’s introduction. Every year logo of the Nehru Trophy Boat Race is selected from entries received from the public by a committee. A competition is held for this and winner is given a cash prize of Rs.2000/- and free pass for the race. This year’s logo is Myna (Mynah) with a colacasia leaf cap and holding a paddle with wings. This year’s winner:: Sh.Jayakumar, Jayan Arts, Alappuzha. The Myna's name is 'Punnara'. The name 'Punnara' was selected from more than 300 entries received from school children upto 7th class and was suggested by Ms.Nebala, a student of 7th class, Believer's Church School, Gurupuram, Alappuzha. The rowers and the cheerers. 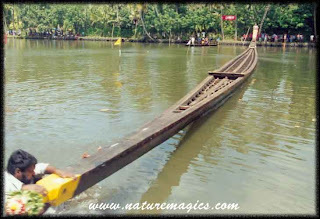 The snake boats of Kerala are unique in their shape, it is very very long when compared to the concepts one may have about the size of boats. More than one hundred rowers are there in each boat! Above the rowers there is a cheering team consisting of five to six who give a rhythm by hitting a long shaft held in hand and hit it at a metal plate beneath to make a drumming sound in consonance with the hitting of the oars on the water. The timing of the drums and the oars striking on the water surface is so perfect that there is only a sound of a shot from a boat. About twenty four snake boats and more than seven types of boats by name Oadi, Iruttukuthi, churulan, Kothumbu, Valavara, Veppu and Kettu in the race each types having their own competition. Among all these the Snake Boat or Chundan is the most popular and glamorous. The Snake boat has a pointed front and a tall hind; these were formerly used by the king’s army for rapid mobilization of personnel, its incomparable speed enabled the army for surprise strike on the enemy’s encampments. These Boat Races are the festivals of the waterlogged area known by the name Kuttanad where boats are essential for mobility and thus a house without a boat was not worthy to be called a home. Different types of boats were used for different purposes when medium quantities of goods were transported via medium sized boats by name Churulan boats which have spiral ends both on the front and hind. The Iruttukuthi was meant for speed with front and hind pointed were formerly used by pirates of the inland lakes and were used to attack boats in the cover of darkness. Nehru Trophy Boat Race has the honor of being the largest team sport in the world. with each snake boat carrying a crew of rowers, cheerers, singers and steerer's numbering well over one hunderd and with more than 18 or so such boats participating it defenitly deserves the title. This Boat Race has become so popular that a lot of tourists from different parts of the world come to see this, recently it has become a trend that people of far away land come and take part in the race, blond ladies working fast on the oars are more a delight to the spectators who cheer for them forgetting the competing local candidates. This race has thus become an integrating factor where people take part forgetting regional and racial barriers. The war horses and the war! When Netaji, Napoleon, Nadubhagom, Valia divanji, Parthasaradhi, all race for the coveted ever rolling trophy (with the signature of none other than Jawaharlal Nehru India’s most glamorous Prime Minister) each boats with more than hundred rowers and the cheer leaders who drum for their team; all under the standing ovation of millions of people who assemble in the galleries as well as on the banks of the lake. The flood, down-pour and the Chikunguniya. The festival is accompanied by the monsoon showers, and most parts of the land remain flooded, for this season the viral fever by name chikunguniya that has cast a shadow on the total atmosphere of gaiety. The spirit of celebration as it has seen has ignored the heavy down pours stating the fact that whether rain or shine celebration is a statement of peoples’ strength and no monsoon has the power to diminish it. No wonder this is the single most event that draws the maximum number of tourists to the God's Own Country. Lets turn on our Televisions the live coverage of the boat race is currently being aired in all major channels in kerala and is available in Doordarshan the national television channel of India as i'm finishing this article. lets wait and see who wins the trophy this season. GRACIAS POR TU COMENTARIO QUE DEJASTE EN MI BLOG EL 30 DE ABRIL. ME GUSTARIA SEGUIR CONTANDO CON TU OPINION, PUES ESTA CLASE DE COMENTARIOS NOS MOTIVAN A SEGUIR ADELANTE CON ESTAS PUBLICACIONES. PROXIMAMEN ESTARE HACIENDO UN VINCULO DE TU BLOG CON EL MIO.